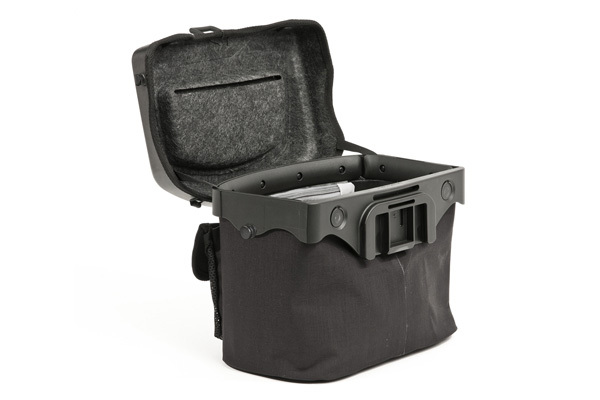 When looking for a handlebar bag solution for randonneuring several friends recommended Ortlieb bags. After looking online at their offerings, I chose the Ortleib Ultimate Pro-M handlebar bag. I was initially worried about the mounting system (it is not to be used on carbon fiber handlebars). It mounts by way of a cable running through a plastic mounting bracket and onto the handlebars with the cable crossing the stem. In no way did this seem like it would be secure. Once the system was installed and the hex bolts tightened, I could easily lift the bike with the mount without the mount moving. This mount was very secure. My first difficulty came when I attempted to install the bag itself. I had brake cables running from the sides of my shifters and crossing in front of the handlebars. For me, the solution was to upgrade my shifters so that I didn’t have cables running where the bag was. Few of those I ride with have shifters with the incorrect configuration. The bag pops on to the mount quite easily. The bag will also lock to the mount. It is also easy to remove. When it is on the bike it is stable and there is no up/down or side to side motion. The bag closes tight with two magnetic closures and clicks shut with a satisfying audible click. This bag is roomy! The specs say it’s volume is 7 liters and the weight limit is 3 kg. I had no trouble filling it to its weight capacity with food and essentials for a long ride, and only half of the volume was consumed. That means there is plenty of room for clothing one might remove during the course of a ride. The velcro dividers are similar to that which you might find in a camera case, and helpfully divide the space into three sections. There is an inside zippered bag for small items or items you may want to keep out of sight when the bag is opened. A very handy key lanyard is also included, missing on so many bags. 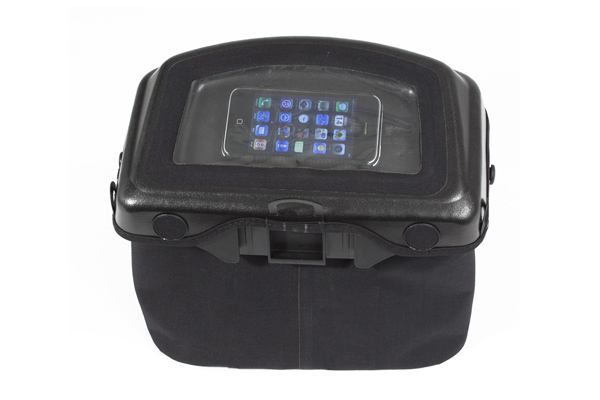 The top features a waterproof slot for a phone or other touch screen device. Placing something in that slot is not convenient or easy. It is a little small for cue sheets. Where this bag shines is in its usefulness when on the bike. The lid lifts from the side facing you and once it is open the lid serves to prevent wind from throwing the lighter items around. Access is wide and convenient. With a little pre-ride organizing, and maintaining the organization through the ride, everything you need is at your fingertips. When it is time to close it, one just moves it back and the magnetic closing system simply works. It is truly a one-handed operation, and easier to use than a water bottle in a frame rack. I doubt I will ever use the included shoulder strap. The map case might be a nice accessory to have. It connects near the front and would cover the top of the case, making a great cue sheet holder. The top photo above shows the inside of the lid. The slot you see is the entry into the space under the clear plastic top. 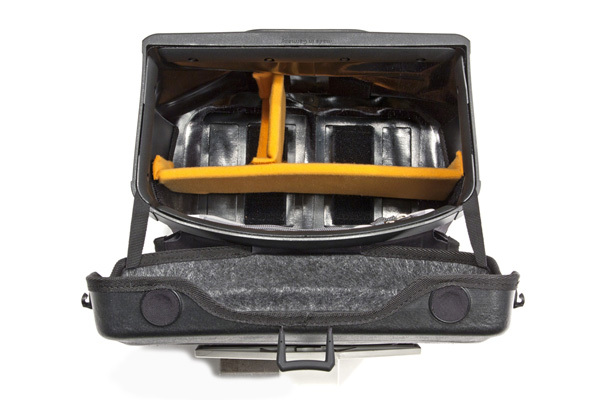 This lid is made of a rigid material and a piece of foam sits between the clear plastic top and the inside of the case. I used this slot to paperclip some notes to the top and found that to be a very useful (although I suspect not planned) feature. Also unused so far is the front mesh bag mounted outside the bag, and not waterproof. I’m not yet sure what I would use that space for. I have no qualms recommending this bag. Many friends who saw it were impressed by its volume and internal organization as well as its secure closing with magnets. Note: I purchased this bag and write this review without remuneration from either Ortlieb or any dealer. The opinions are mine. Images are stock images. Volume: 7L / 427 cu.in. Would be nice with some info I can’t find on the manufacturer’s website. Like how large is the waterproof pocket. What are the dimensions for the opening and some detailed pictures of it, not just the stock photos. Could I get an iPad mini in there for example. I have one of these as well, purchased after doing some research (and your review was one of those that helped me make my decision—thank you for writing it!). So far I have no regrets. One thing I have noticed, however, is that my phone overheats in the lid pocket on sunny days. It’s alright early in the morning, later in the evening, or in cold weather. But I have found my phone has shut down from overheating too often to feel comfortable placing it in that pocket during a sunny Spring day (and Summer is certainly out of the question). I wondered if I should take the foam out again, but without it the phone rattles all over the place and falls out of the lid into the bag. I wish that Ortlieb had accounted for the heat issue with some sort of low-E coating. While wishing, it would have been nice if they had made that part of the lid more accessible, like with a hinge and fastener, so that getting a phone in and out of the pocket was less troublesome. Other than those two issues I love this bag, and would absolutely purchase it again.